This is my smallest sock monkey. He's just under 1 inch. I'd like to make one a little smaller, but I just can't seem to do it. He was crocheted with acrylic punch thread and regular sewing thread. His details were embroidered and he has onyx bead eyes. 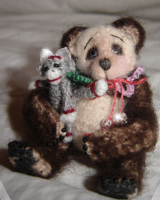 This is another "vintage" bear that I crocheted. She was sparsely needle felted with two shades of wool. I wanted her to look like a Panda bear. Isn't she cute? She's just about 3 inches small. It's been a very busy month and I haven't crocheted at all. 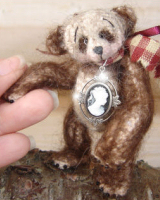 This is one of the last bears that I made. Think I crocheted it in September. It's crocheted from cotton thread and then sparsely needle felted. I wanted it to look like a vintage bear. I don't remember the exact size, but I do know that it was under 3 inches. 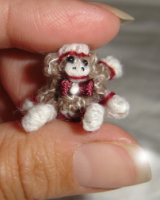 The tiny crocheted sock monkey was made with acrylic punch thread. She's just over 1 inch small. This is my mom and I. 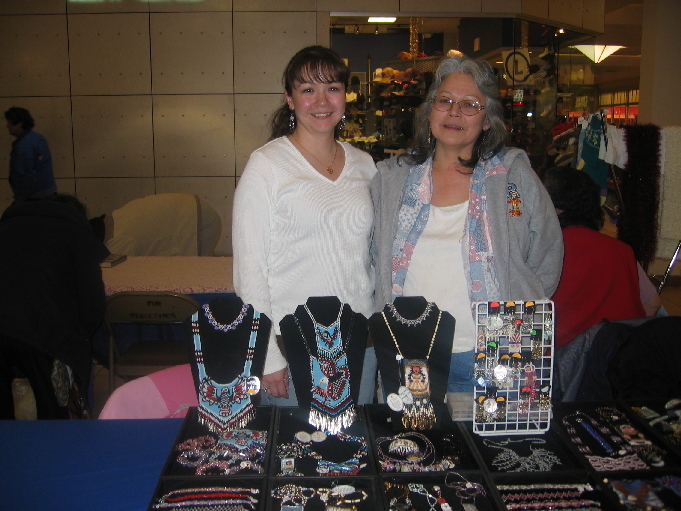 It was our very first time having a table at the Fur Rondezvous in Anchorage. Was a lot of fun and hope we can do it again. 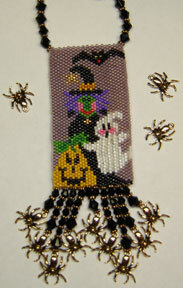 This is one of my amulet purses that was in Bead & Button Magazine. The pattern (including suggested Delica bead numbers) is available in my Bead Pattern Shop. This amulet was especially fun. I used gold-toned spider charms (FireMountainGems.com) on the fringe. I've made this amulet several times as a special order. It actually works up pretty fast. I like patterns with a lot of different colors. I'm so focased on each color change that before I realize it, I'm half-way through! 'Tis the season to bead santas and snowmen. The emails are slowly trickling in and they all want to know the same thing. "What colors did you use for the Santa bracelet in Bead & Button?" This bracelet has been my most popular bead pattern by far!